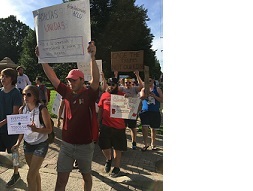 Families in Columbus Ohio, along with their children, came together and took to the streets on Thursday, June 14th from 5-7pm EST. 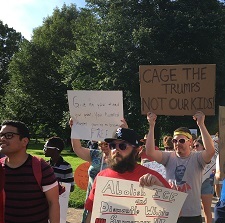 They came together at Goodale Park, to talk about and protest for the end of family separation. 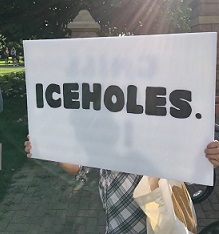 The protest and rally was in response to the “Military-Style” ICE raid that took place June 5th in Sandusky Ohio, on workers at Corso’s Garden Center. Before the protest began, people listened to a very diverse group of speakers, from many different walks of life, as they shared their perspectives on the issue. These were people who were working day and night to support this cause and what had happened to the families of Sandusky Ohio. One of the speakers, Zerqa Abid, is the founder and Executive Director of “My Project USA”. “We are here to protect and empower our youth and their families. This is what we do” Zerqa said in her speech, summarizing what “My Project USA” does. Zerqa went on to say that, “people say ban Muslims and ban Refugees but they don’t remember how much immigrants have contributed to the economy of this country. How much we contribute to our neighbors, employers and to our employees. Thank you all for being here, it gives me hope. It gives hope to all the sisters, brothers and children who could not be here today. Muslims will go to celebrate Eid tomorrow but not all will be with their loved ones. If we all organize, if we all work together, maybe next year will be a different story. Maybe all the Holidays will be a different story next year for families if we all work together beyond these rallies. So, when you post on your Facebook today, please remind people that the Muslim community is committed to social justice and that we are Americans. We’re doing what we can to make America better so God bless you and God bless America and God unite these families sooner than later. Thank you.” It was clear when listening to her speak, that she spoke from a heart that breaks for all families of all nationalities, ethnic backgrounds, and races that are being affected by this issue growing in America and around the world. Robin A. Wright – The Policy Manager for ACLU of Ohio – gave a speech at the end of the rally. “We have to be a nation that upholds the values and humanities of all people. This isn’t a country for some. 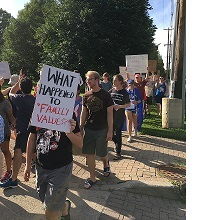 This is a country for all.” She also went on to say that ACLU, along with the support of Ohioan’s and those who spoke at the rally, have raised over $25,000 dollars to help the families of Sandusky Ohio, along with the children who are not with their parents. Robin believes that helping families like those separated by the ICE raid in Sandusky, has to be our main focus right now. “This is an issue for forever until we create a country where we honor people’s dignity and humanity. Until we create a country that recognizes that these tactics of separating people at the border, to intimidate and stop people from wanting to come is wrong, when they’re coming because we’re a country that says, give me your people, give me your weak, give me your forgotten. Then, when they come, we shut our doors? We can’t be that country. That’s not the country I want to live in. Is it the America you want?” This is the thought provoking statement Robin left people with.